William Lester Armstrong (March 16, 1937 – July 5, 2016) was an American businessman, administrator and politician. He was a member of the Republican party and served as a United States Representative and Senator from Colorado. Armstrong was born in Fremont, Nebraska, and graduated from Lincoln Northeast High School. After attending Tulane University and the University of Minnesota without receiving a degree, he served in the United States National Guard from 1957 to 1963. At age 22 in 1959, Armstrong bought radio station KOSI-AM, which became KEZW in 1981. Armstrong founded KOSI-FM in 1968 before selling the FM station to Group W in 1981. Armstrong sold KEZW in 1986. He also was president of Ambassador Media, which owned television station KPVI in Pocatello, Idaho and satellite stations KKVI in Twin Falls, Idaho and KJVI in Jackson, Wyoming. In 1963 and 1964, Armstrong served in the Colorado House of Representatives. He then served in the Colorado State Senate from 1964 to 1972. 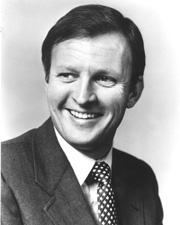 In 1972, Armstrong was elected a United States Representative to the 93rd Congress. He was reelected to the 94th and 95th Congresses (January 3, 1973 – January 3, 1979). In 1978, Armstrong was elected to the United States Senate, defeating Democratic incumbent Floyd K. Haskell. He was reelected in 1984 and served from January 3, 1979, to January 3, 1991. While serving in the United States Senate, Armstrong was the chairman of the Republican Policy Committee (99th through 101st Congresses). Armstrong opted to retire and did not seek reelection in 1990. Armstrong was President of Colorado Christian University at the time of his death, having served in that position since 2006. He was on the Board of Directors for Campus Crusade for Christ. Armstrong became well known for his catchphrase "Jesus, Jesus, Jesus". Armstrong died on July 5, 2016 from cancer at the age of 79. ^ "William L. Armstrong". NNDB. Retrieved October 6, 2012. ^ "Armstrong, William Lester, (1937 - 2016)". Biographical Directory of the United States Congress. Retrieved October 6, 2012. ^ a b c Elliott, Dan (July 6, 2016). "William Armstrong, ex-US senator for Colorado, dies at 79". Associated Press. Retrieved November 28, 2017. ^ a b "William L. "Bill" Armstrong, 1937-2016". Colorado Christian University. Retrieved November 28, 2017. ^ a b "Remembering Bill Armstrong". KOSI. July 11, 2016. Retrieved November 28, 2017. ^ Richard Fatherly & David MacFarland, The Birth of Top 40 Radio Jefferson, N.C.: McFarland & Co., 2014, p. 38. ^ "Group Ownership" (PDF). Broadcasting & Cable Yearbook 1995. R.R. Bowker. 1995. p. A-98. ISBN 0835236013. ^ "Sen. William Armstrong". Govtrack.us. Retrieved October 4, 2012. ^ "Greetings from the President". Colorado Christian University. Retrieved October 6, 2012. United States Congress. "William L. Armstrong (id: A000219)". Biographical Directory of the United States Congress.